She was a former employee of Kroger in Campbellsville, KY, and a native of Illinois. Her husband of 18 years, Cecil Pearson, Jr., survives. She leave eight direct living descendants and a host of other relatives and friends to cherish precious memories. 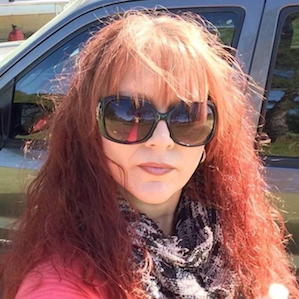 Catherine "Cate" Anne Pearson, age 47, passed away Suddenly on Wednesday, May 30, 2018 at Optim Medical Center Collins, GA. She was a former resident of the Gradyville Community in Adair County, KY.
Visitation is scheduled for 3pm-5pmCT/4pm-6pmET. on Tuesday, June 5, 2018 at the chapel of Low Country Cremation & Burial, 135 N Main Street, Reidsville, GA 30453. Memorial Services are scheduled to follow visitation, beginning at 5pmCT/6pmET, on Tuesday, June 5, 2018 at the chapel of Low Country Cremation & Burial with the Rev. John Griffin officiating. She was a former employee at Kroger in Campbellsville, KY, and a native of Illinois. Her husband of 18 years, Cecil Pearson, Jr.
Low Country Cremation & Burial in Reidsville, GA, 135 N Main Street, Reidsville, GA, is in charge of arrangements. 2018-06-01 - Photo from Stotts-Phelps-McQueary Funeral Home.